Android is the name that Google gives to the operating system that it makes and licences to many of the world’s manufacturers of smartphones and tablet computers. The manufacturers adjust the settings and the appearance of their tablets to give a clear identity to their brand. However, the operating system is still Android; if you know how to use one of the brands, it is easy to use other ones too. 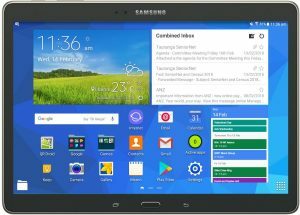 The biggest selling Android tablet in New Zealand (2018) is the Samsung Galaxy Tab. There is a range of sizes available, ranging from 7 inches (screen measured diagonally) to a little over 12 inches. Each brand makes its own claim to fame – a better screen, truer and brighter colours, better cameras, more robust construction, faster processing, more accessories, and so on. In general it is good value for money to spend a little extra to get one of the top brands, but not necessarily their top-of-the-line model. If you do buy a cheap, unrecognised brand, don’t expect too much in the way of high performance or free updates to the operating system. Equally, if it does everything you require of it, then that’s great. There are many thousands of Apps (applications) for Android tablets and phones and they are available from Google’s App store (“Google Play”). Many of the apps are cost free, but you may have to pay to upgrade to the ad-free, fully-featured version. Courses have either 4 or 5 lessons, depending on the number of weeks in each school term. The cost varies accordingly. 5 two-hour lessons – $60.00 including the manual. 4 two-hour lessons – $50.00 including the manual. is suitable for students who have a Tablet computer that has an Android operating system. is designed to help you learn the essentials of using your Tablet. is a prerequisite for other courses that we may develop for Android Tablets. You must bring your Android Tablet to each lesson, with its battery fully charged. You should also bring the charging unit and cable in case of need. A Smartphone is pocket-sized tablet which also has the ability to use cellphone technology to make phone calls and send or receive text messages. Its cameras can take great snapshots (including selfies) and can be used to make video calls to friends all over the world. That’s just a few of the hundreds of tasks it can perform. Courses have either 4 lesssons or 5 lessons, depending on the number of weeks in each school term. The cost varies accordingly. Important: This course is for people with Smartphones that have the Android operating system (e.g. Samsung and Huawei). So if you have an iPhone or a Windows phone, this course is not for you. There are two items which you must bring to use during the session. Note: A Gmail Account is free and it is necessary for accessing the App Store (Google Play).